According to BreastCancer.org, about 1 in 8 U.S. women (about 12%) will develop invasive breast cancer in her lifetime. An estimated 231,840 new cases of invasive breast cancer are expected to be diagnosed in women in the U.S. in 2015, along with 60,290 new cases of non-invasive (in situ) breast cancer. And breast cancer is not just for women: about 2,350 new cases of invasive breast cancer are expected to be diagnosed in men in 2015. A man’s lifetime risk of breast cancer is about 1 in 1,000. Arthur Buhr, III’s Schock 40 Leverage was the overall winner in the 2014 PWYC Charity Cup Regatta. © Andrea Watson, Sailing Press, Inc.
Everyone has a friend, a mother, a daughter or sister who has breast cancer or is a survivor. That’s why the Port Washington Yacht Club in Port Washington, NY has selected AVON39: The Walk to End Breast Cancer, benefiting the AVON Foundation for Women, as their charity of choice for the 18th Annual Charity Cup Regatta. The weekend of parties and racing begins with a gala dinner dance on Saturday night, September 12. Music throughout the night under the tent on the south terrace sets the mood for those who stroll down the dock to enjoy the always popular wine tasting from Long Island wineries and beautiful vistas of Manhasset Bay looking north to Long Island Sound. Don’t forget to check out the terrific items in the silent auction and raffle. The evening wouldn’t be complete without the extra-special dinner menu (if you’ve ever been to PWYC, you know the food is terrific) and a great band to keep people dancing throughout the night…well, maybe not all night. The Charity Cup Regatta takes place on Sunday, with an all-day barbecue for those waiting to greet the racers back at the club for the Awards Ceremony. 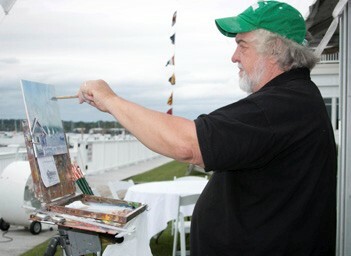 During the afternoon, Lawrence Chrapliwy, Artist-in-Residence at the Cow Bay Historical Society and a member of the American Society of Marine Artists, will be painting en plein air. Chrapliwy is widely recognized as an incredibly gifted painter as well as a teacher, and his works are highly prized by collectors. One of his paintings is hanging in the halls of Congress. Artist Lawrence Chrapliwy is donating an oil painting to the overall winner of the 2015 Charity Cup Regatta. ©Andrea Watson, Sailing Press, Inc.
Chrapliwy has generously agreed to donate a 12” x 16” oil painting of the winning boat again this year. Last year’s overall winner, Arthur Buhr III, won a painting by Chrapliwy. To see the artist’s work, visit lawrencemaritimeart.com. 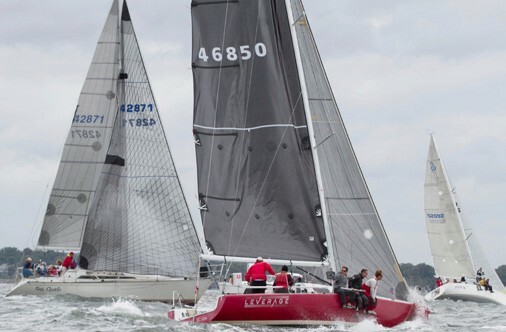 The regatta is open to single-hull yachts whose owner is a member of the Yacht Racing Association of Long Island Sound or a recognized club or association affiliated with US Sailing. There will be divisions for PHRF, IRC and One-Design boats, and a special non-spinnaker class. The $75 entry fee includes the BBQ for skipper and up to eight crew. Deadline for entry is 5:00 pm Saturday, September 12. If interested in donating to the AVON39: Walk to End Breast Cancer, go to AVON39.com, click on “TEAM,” then enter “Team Aurora.” For more information about the Charity Cup Regatta, contact Andrea Watson at racecommittee@pwyc.org or agwatson@sailingpress.com.